Unfortunately, OPI’s Steady As She Rose ended up being a nightmare to apply and not not very flattering on my skin tone though that is not OPI’s fault but rather genetics. Still, rather than remove Steady As She Rose, I decided to try to revive it with Barielle’s Buddha-ful to save myself some time this week. Unfortunately, the poor formula of Steady As She Rose still shows up in my application of the base polish, but please try to ignore it and enjoy the beauty that is Buddha-ful. The Application: Unlike some of the other Barielle colors I have tried, Buddha-ful went on perfectly and was not runny at all. Because I only needed Buddha-ful to bring my manicure to the next level, I only used one coat. I promise that in the near future I will show a swatch with Buddha-ful all by its glorious self so you can get a better idea of how many coats it takes to be opaque and how it stands alone. The Color: Over Steady As She Rose Buddha-ful looks like a pale lavender with pink and greenish blue foil flakes. On its own, Buddha-ful is a light beige and pink polish with pink and greenish blue foil flakes. Either way it’s a beautiful, delicate color with a little oomph. Buddha-ful would be perfect for many occasions including the office. The foil flakes are so subtle that I can’t imagine anyone giving you the evil eye for wearing this polish. A little note, the flakes are at their best in low light as you can see from the pictures. For some reason, they don’t always appear as strongly in bright light. The Verdict: Come on! I love it! Buddha-ful is the prefect layering polish though it can definitely stand on its own. I personally think Buddha-ful is at its best when layered over other polishes especially darker vampy colors. I will be using this one for a long time. It’s perfect for sprucing up old manicures that need to be revived or just to add a little zing to any polish. Love, love, love! PS: As stated above, the foil flakes show up more in low light so I have added a few more pics to show the effect. In the second photo, I took Buddha-ful in half and half lighting to show you how it plays peek-a-boo depending on the lighting. Sometimes, when you have a crazy, busy week like I’ve had, you don’t have time to redo your polish. Or sometimes, you’re just too lazy. Yep, been there done that. Best way to resolve the issue? Get a few glitter or flake polishes to slap over the old mani and voila! Fresh new mani for another 2-3 days. I lived this dream this week after wearing China Glaze’s Ahoy for 5 straight days. Though it held up well, it still had a little wear and tear and needed a little boost. That boost came in the form of Barielle’s Elle’s Spell. 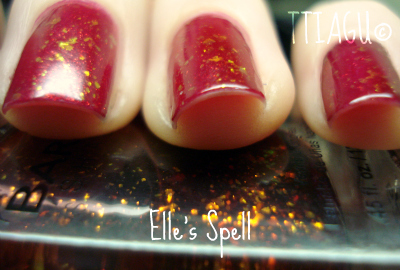 The Application: Elle’s Spell went on smoothly though it was a little thinner in consistency than I am used to. Because of the consistency it was a little harder to control the polish and it did bleed into the cuticles as you can see by the photos. Unfortunately, I had to slap on a fast dry top coat and head out the door instead of fixing it. Because I had two coats of Ahoy on my nails already, I opted to use only one coat of Elle’s Spell. The Color: The bottle is very deceiving as it looks like the polish is a dark red with various sized red flakes, but on the nail it’s a pinkish, red jelly with gold and reddish flakes. This polish is made for layering! Especially on red and dark polishes but it definitely can be worn on it’s own though it takes 3-4 coats to become opaque. The flakes are gorgeous! The Verdict: This is the color to buy if you are in need of a layering polish. Elle’s Spell is the perfect color to revive a mani that’s on its last legs or if you are looking for a polish that will add a little extra something to your red or black polish. This was my first time using Barielle nail polish and I have to say I was quite pleased. 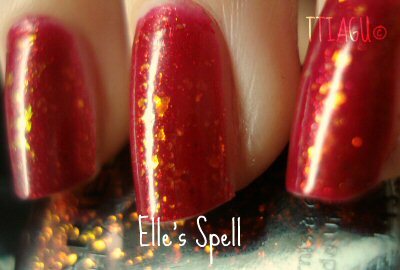 Elle’s Spell is gorgeous and I can see myself using this a lot during the winter.